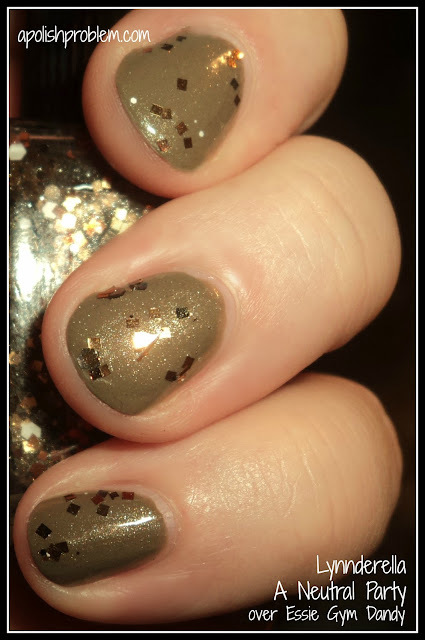 This is 2 coats of A Neutral Party over 2 coats of Essie Gym Dandy, a deep taupe from this Fall's Yogaga collection. I also used 2 coats of Sally Hansen Insta-Dri, one over the base color and one over the glitter. A Neutral Party was the one I kept waffling on in my selections. And even after I sent my order, I was kicking myself for not ordering One Nutty Fruitcake instead (especially since it appears that it is now OOS). However, once I put on A Neutral Party, all the kicking stopped. I have had this on all day and I can't stop looking at my nails. LOL. I absolutely love it over Gym Dandy, though I can't wait to wear it over darker shades, like a dark red. A Neutral Party applied very well and I had no issues with getting the glitter on to the nail. It also was almost completely smooth after just one coat of topcoat. I would have done a second coat to completely even it out, but my bottle of Insta-Dri is gloopy and hard to use, so I just did the one. One thing I did notice is that these are a bit stinky. When I first got them, they were very smelly, almost like Kleancolors, but after being in my house for a couple of days, that has died down somewhat, but they still smell like they are chocked full of chemicals. I'm sure that I have lost many, many brain cells to nail polish fumes over the years, so the smell, while present, didn't really bother me while I applied this. Lynnderella A Neutral Party was purchased by me and Essie Gym Dandy was sent to me for review. Nice neutral color, though the glitters made nails glam too. ADOREI O SEU BLOG! PARABENS PELA NAIL ART! Interesting article. Nonetheless I must claim you might generate monies this blog to help generate much exposure.